James Harris Gallery | Richard Rezac: "New Work"
James Harris Gallery is pleased to present our fifth solo exhibition by Richard Rezac. 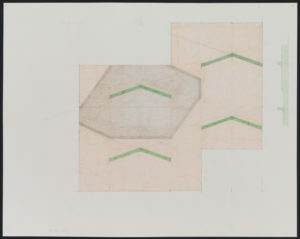 The exhibition consists of five sculptural works and two drawings that identify the core practices and strategies Rezac developed to investigate geometric abstraction. The drawings are studies for the sculptures. Each sculptural piece is meticulously worked out on paper where each element has an analytical relationship to one another. The drawings are therefore and insight into the artist’s working process and yet are beautiful works on their own. Rezac creates subtle compositions imbued with dynamic tension. 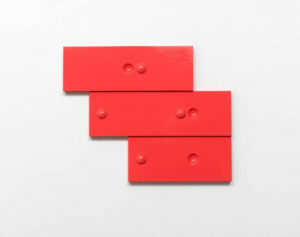 He sensitively juxtaposes both materials, such as painted wood with aluminum or cast bronze, and color, making his practice a reductive one that brings together a minimal number of elements within any one work. Rezac’s sculptures are intimate and quietly inform the spaces they occupy. 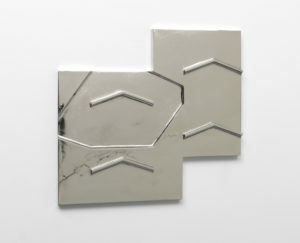 Each work is purposely situated, whether on floor, mounted on the wall or hanging above. His sculptures push the conventions of sculpture through its placement or location and the consequent relationship to the viewer. 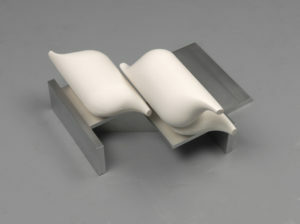 Made out of cast plaster and aluminum, the floor sculpture “Untitled (11-02)” is intimate and elegant. Three swelling ovoid cast forms with tapered ends are situated on top of an aluminum support. The curving oblong shapes of plaster not only contradict the geometric rectangles of the metal but also call attention to the physical properties of each material. Repetition is an important element of Rezac’s vocabulary. There is interplay between biomorphic volume and hard edge geometric form. 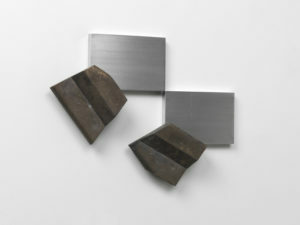 In another work, “Untitled (12-03)” three horizontal bands are positioned in an even step formation. A meticulous pattern of convex and concave circles punctuates each band giving it rhythm. Rezac’s choice of color, a glossy coral, imbues the piece with a quality of the manufactured but upon closer inspection; the hand of the artist is revealed. . 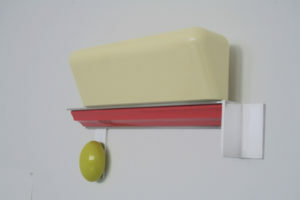 While still sculptural, it is significant that “Untitled (12-03)” is attached especially close and parallel to the wall. Departing from the conventions of relief sculpture, which relies on projected form and shadow for effect, these works hover ambiguously between painting and sculpture. 16" x 17 1/2" x 1 1/4"
10 1/2" x 19" x 18 3/4"
13 1/2" x 17 3/4" x 2 1/2"
24 3/8" x 30 3/8"
16" x 19 3/4" x 1 1/2"
12 1/4" x 20 1/2" x 5 3/4"